As a fire fighter it is my duty to be prepared for the unexpected at a moment’s notice. CFC’s attitude and training philosophy was the push I needed to step out of my comfort zone and take my fitness to another level. CrossFit provides the platform that prepares you for the unexpected. I love that I get to be myself and work with awesome people that share the same interests. We are all different yet when we come together at CFC we are one in the same. I love coaching at CFC because I like seeing others achieve what they initially thought they couldn’t. Fair warning: I’m going to push you – to be your best and give your max effort everyday! My CrossFit favorites are the Olympic Lifts so, if you have an interest in taking your lifts to another level contact me! I started and stuck with a bare bar for a long time, strength will come with confidence! 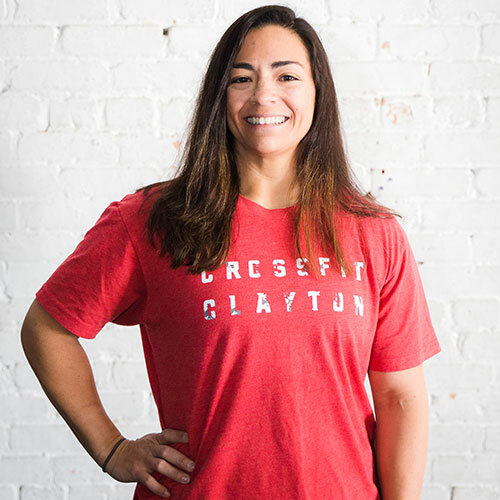 I have competed in several CrossFit competitions as an individual and a team member, I competed in my first strongman competition placing second and qualifying for nationals, and I have run several 5K races. I taught Group Aerobics for a few years until I fell in LOVE with CFC, the place where magic happens and bonds are made! !